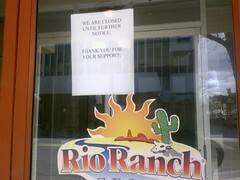 Rio Ranch Grill – What’s Up? Remember back in August I posted a favorable mini-review of the new restaurant downtown, the Rio Ranch Grill? Got a bit of feedback on that entry, not very positive. I ate there again – for lunch – in November with a couple of friends, and sadly the service was pretty lousy, and the food wasn’t all that great. But still – I had resolved to give it another shot, but when passing by earlier today I saw this sign on the door: “We Are Closed Until Further Notice. Thank You For Your Support.” So – does anyone know what’s going on? My husband and I had planned on eating there just a couple of days ago and noticed the open sign was not lit and the blinds were closed. We didn’t make it to the front door, so we figured they were just closed that day for an odd reason. We had gone there once weeks back and were very impressed by the food and the service (we had no problems) and the price was very affordable for such large portions.